This will also be the perfect necklace to go with any party outfit you could think of. Let it give you that extra bit of dazzle to make you shine no matter where you are. This is a necklace that exudes luxury and brilliance but that’s still simple enough to work well with a wide range of different outfits. You’ll be sure to reach for this piece year after year, always feeling like a star whenever you put it on. If you’re looking for jewelry that gives off a sense of luxury as well as classic beauty, then the So Classic Necklace is the perfect choice for you. 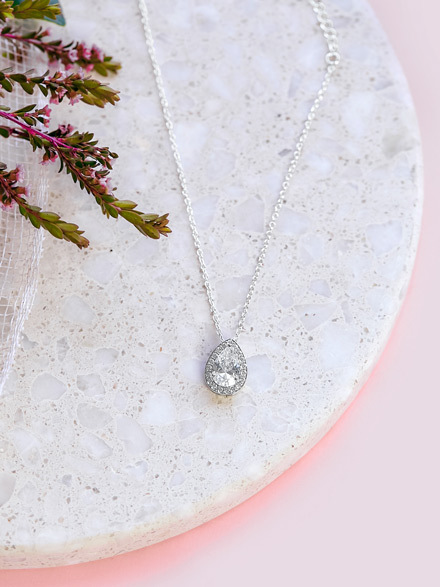 Made up of a stunning diamond pendant encircled by smaller diamonds all hanging from a perfect silver chain, this necklace is sure to add just the right amount of sparkle to any sort of style. Designed to catch the light and be the ideal complement to a simple and elegant dress, this beautiful necklace will draw all eyes to you, making you the center of attention like you should be on this special day. When it comes to picking the perfect jewelry for your wedding, you want to find something you really connect with. This amazing necklace was designed right here in Australia, meaning you will be certain to feel the care and devotion that went into its creation. It will be more than just a trinket, it will be a part of who you are and where you came from. Pick jewelry that really means something to you so that you’ll love wearing it on that special day and for years to come. Looking for wedding earrings to match Hello lovers Australia will have them. Or possibly a Bridal dress bracelet.